FLUTAN is a highly vectorized computer code for steady and transient 3d fluiddynamic and thermal-hydraulic analyses in Cartesian or cylinder coordinates. 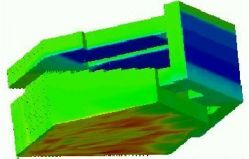 It was developed in order to simulate single phase flows with small compressibility. The conservation equations for mass, momentum, energy, concentration of a contaminant, and turbulence quantities are solved. Material property libraries are available for the fluids water, air, sodium, lead, and lead-bismuth. The equations are discretized on a structured grid by a finite volume method. A staggered grid is used for the velocities. The discretization of the diffusive terms is performed by a central difference scheme. A first order upwind or one of two second order upwind methods (QUICK and LECUSSO) can be chosen for the convective terms. Several Poisson solvers are available for pressure calculation by means of the ICE technique, e.g. the CRESOR solver. A first order implicit Euler-method is used for time discretization. Newly developed and implemented numerical features are achieving a larger efficiency and an improved accuracy: One is an explicitly treated static local grid refinement method for the Cartesian grid. The other one is a new method to use body fitted coordinates in a code basing on a staggered grid: the conservation equations are transformed from the Cartesian to a general curvilinear system by keeping the physical Cartesian velocity components as dependent variables and by defining three Cartesian velocity components on every cell surface. Several turbulence models are available in FLUTAN basing on transport equations for some turbulence quantities. The most important one is the Turbulence Model for Buoyant Flows (TMBF) which consists of a first order k-eps model in a low-Reynolds number formulation and a second order five-equations turbulent heat flux model. The TMBF contains a number of models which were developed for variable Prandtl number applications on the basis of our Direct Numerical Simulation results from the TURBIT-code. In several benchmarks it turned out that the TMBF in its current development status is a powerful tool at least for forced and mixed convection even for liquid metal flows. The model development activities concentrate on achieving a wider application range of the more sophisticated turbulence models. Applying a porous body concept with mesh-cell dependent porosities and direction-dependent surface permeabilities allows to model effectively internal structures with scales below the grid widths and to mimic internal and external walls at cell surfaces. 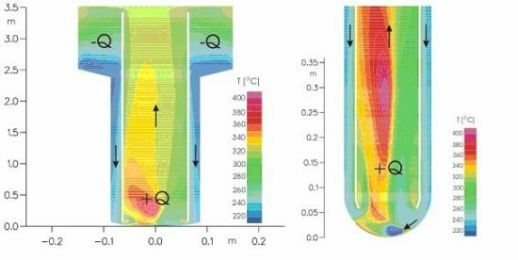 Special thermal boundary conditions are available like a heat exchanger model, a 1d wall model, and a model for heat radiation from solid surfaces. A 3d heat conduction model for solid structures was developed for simulating their internal non-uniform transport of heat. The structure temperatures are discretized on a separate grid on which the heat conduction equation is solved. These tools were undergoing a permanent extension and modification. By developing adequate interfaces, interactive geometry specification and meshing was possible; a TCL/TK based user interface allowed to handle the code system and to control interactively running jobs; several output interfaces allow to analyse the results by some graphics tools, e.g. it is possible to animate even 3d presentations of data by the AVS software. Temperature field in the MEGAPIE module and in its bottom part. The PbBi is coming down from the annular cooler in the thin annular gap, is volumetrically heated at the lower 0.3 m by the proton beam, and is rising inside the steel guide tube due to buoyancy forces. The bypass jet to cool the hemispherical steel ‘window’ is modelled by a cold fluid source of 1.18 kg/s. The heat transfer through the guide tube heats the down-coming fluid strongly up and thus makes the window cooling less efficient. (Groetzbach et al. 2002). and to predict the flow and cooling behaviour in ADS targets and in the related MEGAPIE target module (see lower figure above). Bottoni, M., Willerding, G., Advanced solution algorithms for transient multidimensional thermohydraulic flow problems in complex geometries with the program COMMIX-2/KfK. Nucl. Engng & Design 100 (1987) pp.351-65. Borgwaldt, H., CRESOR, A Robust Vectorized Poisson Solver Implemented in the COMMIX-2(V) Thermal-Hydraulic Code. Int. Conf. On Supercomputing in Nuclear Applications (SNA 90). Mito City, Japan, March 12-16 (1990) pp. 346-351. Willerding, G., Baumann, W., FLUTAN 2.0 Input Specifications. Forschungszentrum Karlsruhe (1996) FZKA 5712. For further references on the FLUTAN code and its applications consider the databank of FZK publications and search for the publications of the authors listed above.